Groupware is evolutionary and difficult to develop and maintain. Thus, its code becomes unstructured and difficult to evolve. 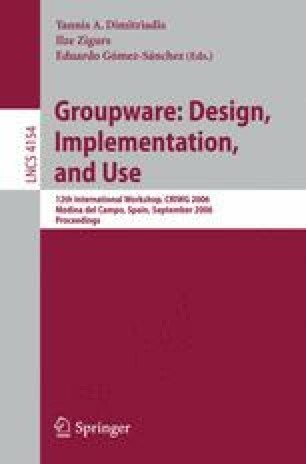 In this paper, a groupware development approach based on components organized according to the 3C collaboration model is proposed. In this model, collaboration is analyzed based on communication, coordination and cooperation. Collaboration requirements, analyzed based on the 3C model, are mapped onto software components. These components aid developers to assembly groupware. The RUP-3C-Groupware, which is a groupware development process, is used for that purpose. This process is a RUP extension focused on groupware domain, and is the result of 8 years of experience with the development of collaborative services for the AulaNet Project. The proposed approach is applied as a case study to the development of the new version of the AulaNet environment. In order to instantiate the environment’s communication services, 3C based component kits were developed for the case study. The components allow composition, re-composition and customization of services to reflect changes in the collaboration dynamics.